Four diseases have broken out in the world. They are outbreaking fast and time is running out: a team of specialists must find cures for the disesases to save mankind. The game begins at a slow enough pace for even beginners, but by the end of the game, the diseases are spreading faster and faster and this makes the gameplay feels even hectic. This game differs from most board games in that players must all working together, instead of playing against each other. 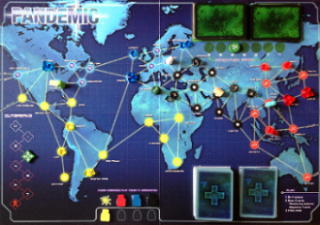 As a team, all players, have to coordinate their actions to stop a global pandemic. The game is essentially one giant puzzle. 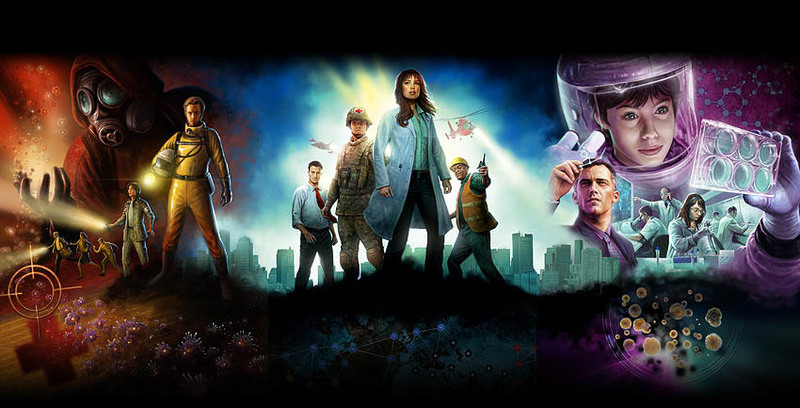 Each player is assigned to a random expert: a researcher, a scientist, a medic, a dispatcher or an operations expert. They all have their own advantages and they player have to maximize it to win the game. The players are limited to 4 actions during each turn. Also hard choices have to be made all the time. Do you save a region from the Blue Plague or do you sacrifice it so you can hurry up to discover cure. On the end of each turn, you must draw a deck of infection cards and this determines where the diseases spread. To win the game, all the players must research cures for all the diseases. 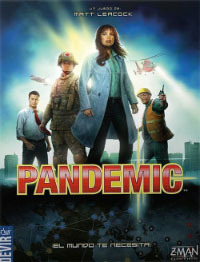 Pandemic offers the players a cooperative experience. This can be fun but only when everyone can play together like a real team. There is the potential for one experienced player to play the game single-handedly as he can give all others orders how to play. Then the puzzle can be solved but it's not much fun for the other players. But a good side effect of this game is that a lot more conversation and interaction between all the players occur. Pandemic pushes the players to talk with each other about the strategy and available options. The board game not too difficult and you can learn to play it quiet fast. A very nice feature of the game is that the difficulty is adjustible. For rookies, there is a special recommended beginner setting, while more experienced players can add additional epidemic cards to the game. This makes Pandemic challening for everyone. 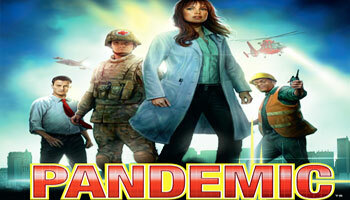 Pandemic can be played both by adults and children, but probably adults will like it more because of the theme. The game can be played from 2 to 4 players, but 3 and 4 player games are more fun because of the increasing interactions between the different experts. Also know that the more players you add, the more difficult they game becomes. The game was published by Z-Man Games in 2008. There are several versions/expansions available like Pandemic Legacy and Pandemic: On the Brink. 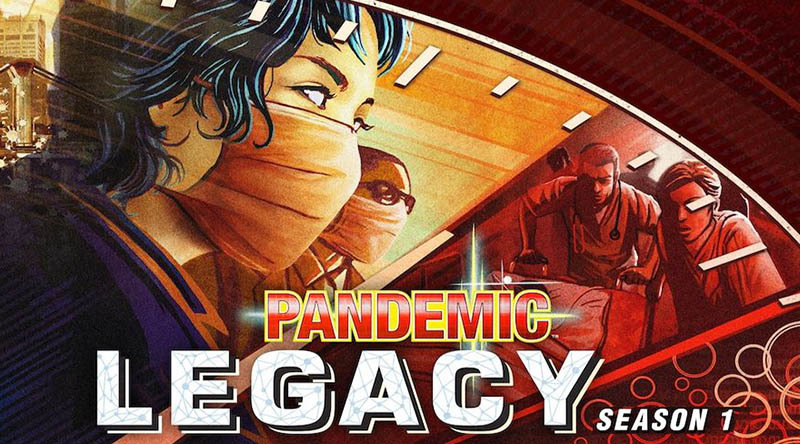 On gameboardgeek, Pandemic Legacy is even been nominated as best board game. Place the Board in the center of the table within easy reach of all the players. Shuffle the Role cards and deal 1 to each player. Each player takes their corresponding pawn and puts it in Atlanta. Put excess Role cards and pawns (if any) back into the box. Place 1 Research Station in Atlanta, and place the others near the side of the board. The world is falling apart. Four diseases are sweeping the planet and your team is on the front lines. Worse yet, one disease has shown signs that it may become resistant to any treatment. 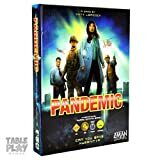 Pandemic Legacy is a cooperative game where all players must work together to develop cures and prevent disease outbreaks, before 4 diseases contaminate humanity. You will all win or lose together. Can you survive the year and save humanity? You must find a cure for at least one disease within the first 3 rounds. Don't play special cards too early. Do not do anything without asking: why am I doing this? Stick to your roles abilities whenever possible!